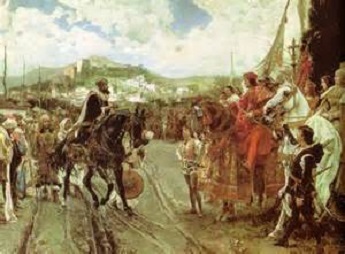 Fall of Granada (1492) - In the same year that Columbus sailed the ocean blue, the Spanish conquered the last Muslim stronghold on the Iberian peninsula. In fact, it was the Fall of Granada that opened the door for Columbus' voyage. Until then, Spain had to devote its resources to the Granada War. The two most powerful Spanish kingdoms united through the marriage of Isabella of Castille and Ferdinand of Aragon. After almost 800 years, the Spanish had reduced Muslim occupation of the Iberian Peninsula to the southernmost region known as the Emirate of Granada, with its capital in the city of Granada. In April 1491, the Spanish advanced on the city and laid siege to it. They brought with them cannons and a new type of firearm known as the arquebus. Cannons became more widespread in warfare about this time and they would eventually render city walls useless. By November, Sultan Muhammad XII was forced to surrender. A treaty was signed granting Muslims two months to leave. Jews who had lived in the Emirate of Granada were allowed to stay provided they converted to Catholicism. Those who did not were exiled. The city officially capitulated on January 2, 1492. The end of the war freed up the Spanish treasury to pursue other endeavors. Later that year, King Ferdinand and Queen Isabella decided to back Columbus' proposal for an expedition seeking a trade route to Asia by sailing west.